Most items are done on a limited run so check back from time to time to see what we have for sale. We rely on our merchadise sales to keep the site running and free from ads so please do buy something - every little helps! We've run out of time to produce a new Wallchart for this season but we do have a couple left from 2017/18 if anyone wants one. 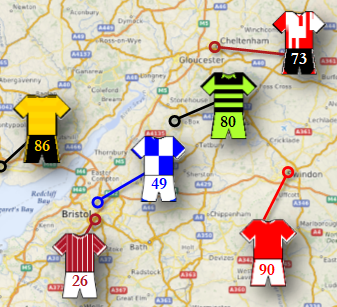 Hand-drawn kits and pointers to the location of each League ground. Table showing the average League position for each of the 92 teams. Boxes showing information about each team and ground. 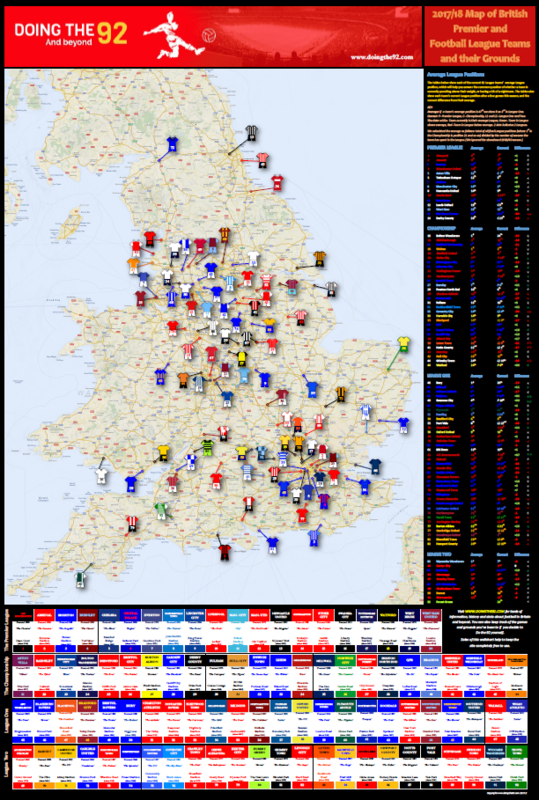 As with our original wallchart this one is also styled on the Bartholemews maps from the 1970s and shows the location of all 92 League grounds, as well as the 2017/18 home kits for each team. You can learn even more about the teams at a glance, including the year they were formed, their nickname, the name of their ground and when they first played there. We've added an interesting table this season showing the Average League Position of each of the 92 teams over their League history. This was calculated by adding together their final League position for each season and then dividing by the number of seasons spent in the League. This allows you to quickly see just how good your team has been on average, and also compares it against where they are now so you can see if they are punching above their weight or having a bit of a nightmare. We've also created a new background map of England and Wales for this year, which shows more towns and roads. These maps have proved popular with fans of all ages and they make fantastic gifts for those hard-to-buy for football fans! Click on the button below to place an order. We expect the initial run to sell out quite quickly so we recommend ordering soon if you want to make sure of receiving one. We've held the price the same as last season: the wallchart costs £20 plus £5.50 p&p. Please email us if you would like a wallchart sent overseas and we'll work out the shipping for you. We've got the following three T-shirt designs available at the moment, all designed especially for us by Lucy B. Something for everyone we hope. 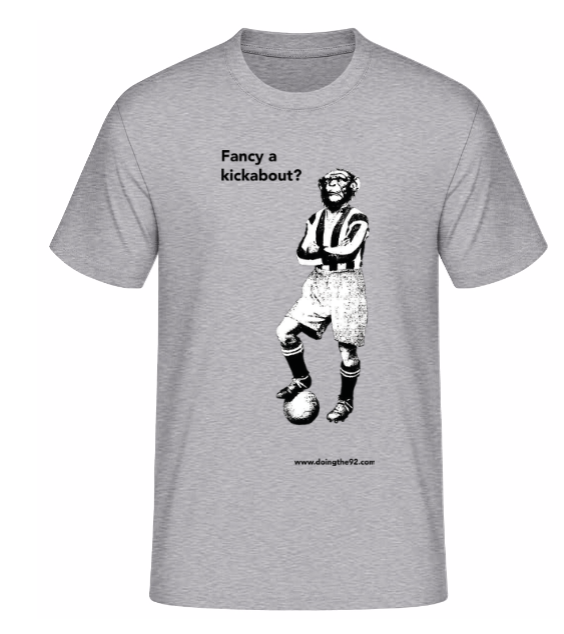 All T-shirts have been reduced by 20% - now just £20 plus p&p each! 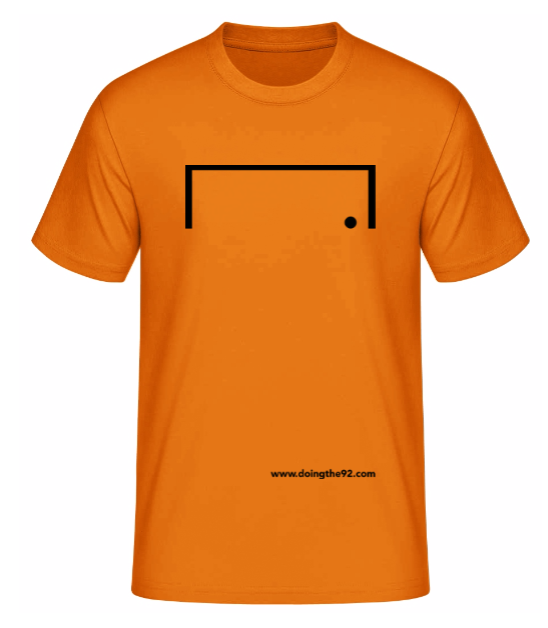 The shirts come in the colours shown and we have mainly L or XL although we can order other sizes if you ask. Click here for the size chart. Who doesn't love an enamel badge? 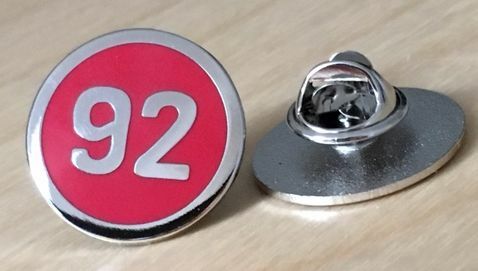 Show your fellow fans you're on the way to the 92 with this special number. They are 2cm in diameter and attach with a butterfly clip at the back. 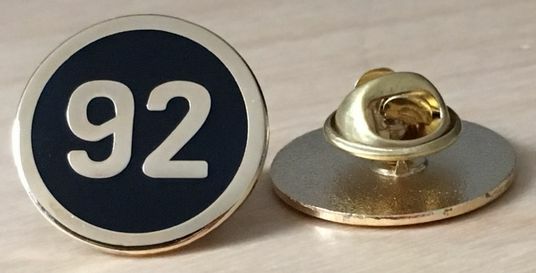 And for those of you who have completed the 92 at some point (and we will check) these special black and gold versions have been produced. 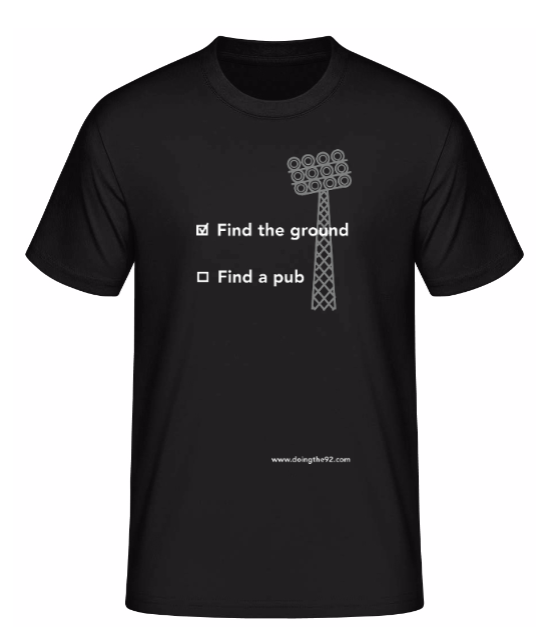 These are going to be very rare but please only apply for one once you can prove you have visited all 92 grounds at some point.